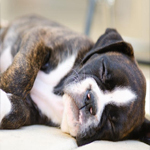 Aviara Animal Health Center cares deeply about our patients' health and care. Here are some of the stories from our very own clients and their pets. 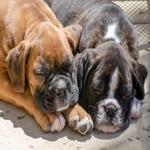 See for yourself why we are considered one of the best, most compassionate veterinary practices in the Carlsbad, CA area. Every month we choose a patient to highlight as our Patient of the Month and this month sweet Laila was chosen to share his story. 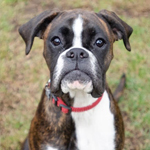 Laila is a six month old boxer puppy, named after the amazing human female boxer Laila Ali. She is absolutely a momma’s girl and prefers to sit with as much of her growing body on mom’s lap as possible. (This is getting less possible as she grows so quickly!) She also loves to get into things and chew them up. Aside from the patio furniture, her own dog beg and stuffed puppy toy, she also got a hold of a bouncy ball that she swallowed. 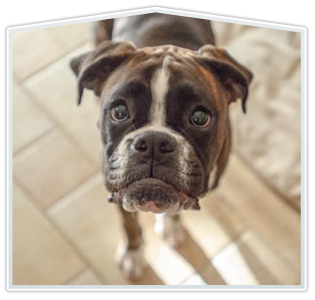 Though she has been a patient of Dr. Herman’s since she was first brought home, this new challenge involved all of the staff in a several day treatment, monitoring, and resulting surgery to remove the bouncy ball from the intestine where it had lodged, leading to some pretty scary results. But the doctors and staff at Aviara stayed with her through it all! While it was a wonderful day when her family got to take her home, the staff were all a little sad that their new friend was leaving. And Laila was all wagging and kisses for everyone. She’s a very friendly dog, but she really does love everyone at Aviara, and I believe it is evident in the quality of care and attention that they gave her that they love her as well.